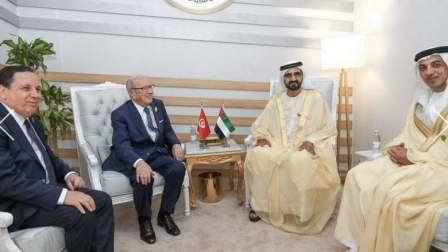 His Highness Sheikh Mohammed bin Rashid Al Maktoum, Vice-President and Prime Minister of the UAE and Ruler of Dubai met on Sunday, on the sidelines of the 29th Arab Summit, currently held in Dhahran, with President Beji Caid Essebsi, President of Tunisia. They discussed items on the summit's agenda and expressed confidence that it will result in positive resolutions that would serve the interests of Arab national causes. The meeting was also attended by Sheikh Mansour bin Zayed Al Nahyan, Deputy Prime Minister and Minister of Presidential Affairs ; Dr. Anwar bin Mohammed Gargash, Minister of State for Foreign Affairs and Reem bint Ibrahim Al Hashimy, Minister of State for International Cooperation.